We are flying through this year friends! I can't believe it is already May! Here are your marriage prayer calendars for this month! Simply click on the link below the images to print your copy! I pray that these marriage prayer calendars continue to be a blessing to your marriage! I received work last month that a dear friend's teenage daughter is using the Scripture Prayer Calendar for My Husband to pray the Scriptures over her future husband! That really blessed my heart! I really do believe in praying for one's future spouse so I was very happy to receive that message. We can trust that God will answer when we pray His word friends. So let's not grow weary, but look to God and His Holy Spirit to strengthen us as we fight for our marriages through the gift of praying God's Word over our spouses! Sweet blessings to you and yours! My husband and I just got back from Gatlinburg, Tennessee on Monday. We went back to the place where we honeymooned 20 years ago! Yes, that's right! We are celebrating 20 years of marriage on Wednesday, April 5th! To God be ALL the glory! We are so thankful for the hand of God that has been so evident in our marriage and in our lives. We had so much fun together during our 3 day stay in Gatlinburg. Our cabin, Sugar Booger is its name, looked exactly the same as it did when we went there for our 10 year anniversary and even the same as 20 years ago when we honeymooned there! Nothing had changed! It was really hard to believe. I'm so thankful the same CAN NOT be said for me or for my husband, Phil. We both have changed these last 20 years together. Sure, I'm not happy about the weight I've put on (wink! ), but I am thankful I'm not the same woman I was spiritually 20 years ago. I'm thankful for the hard times of marriage (yes, let's be honest - marriage is hard at times) that have caused me to draw closer to God and ask Him for His help to mold me and shape me into the wife Phil needs me to be. And so much more! All of these beautiful characteristics of God have been made alive in me through the power of the Holy Spirit at work in my life. It's a choice every wife and every husband have to make in their marriage. I'm thankful to have been blessed with a husband who has made that choice to grow in God and allow the power of the Holy Spirit to work in his life as well. It really does make a difference in marriage. Encourage your spouse and their relationship with God. Help keep them accountable (in a loving way of course) to be in the Bible and to pray every day. Read the Bible and pray TOGETHER every day. It's Living Water for your marriage. As I look back over these past 20 years, I'm so thankful for all of God's blessings that we have enjoyed! So many good memories with our children and extended family. There are even painful memories like the loss of our first child at 6 weeks into my pregnancy, the loss of both of my grandmothers, a sister, and both of my parents. God has been with us through it ALL. And I know He will continue to be with us as we grow old together. Marriage is under attack from Satan. I think we all know and understand that. Therefore we have to take a stand for our marriages by coming against our enemy through the power of prayer! I'll never forget the day God spoke into my heart about the importance of praying for Phil. I wrote a blog post about this called The One Realization That Has Totally Changed My Marriage. I'll be sharing that with you soon so stay tuned! For now, here are your April Scripture Prayer Calendars for Your Husband and for Your Wife. Simply click on the links below the images to get your free Scripture Prayer Calendars! Praying that your marriage is strengthened through the power of prayer! I've been so excited to share the March Scripture Prayer Calendars with you all! I've had this idea of what Scriptures to use for this month's prayer calendars since February 4. It's a theme that God continued to put in my path for several days. This month I'm excited to announce our prayer calendars will focus on Praying the Promises of God for Your Marriage! My husband read a verse of Scripture at our church's prayer meeting on the last Wednesday night of January. It was Psalm 91:4. I've heard this verse many times, but this time something happened. As soon as he read this verse, my heart quickened as the truth of God's Word filled my heart. The words "His faithful promises are your armor and protection" resonated in my heart. 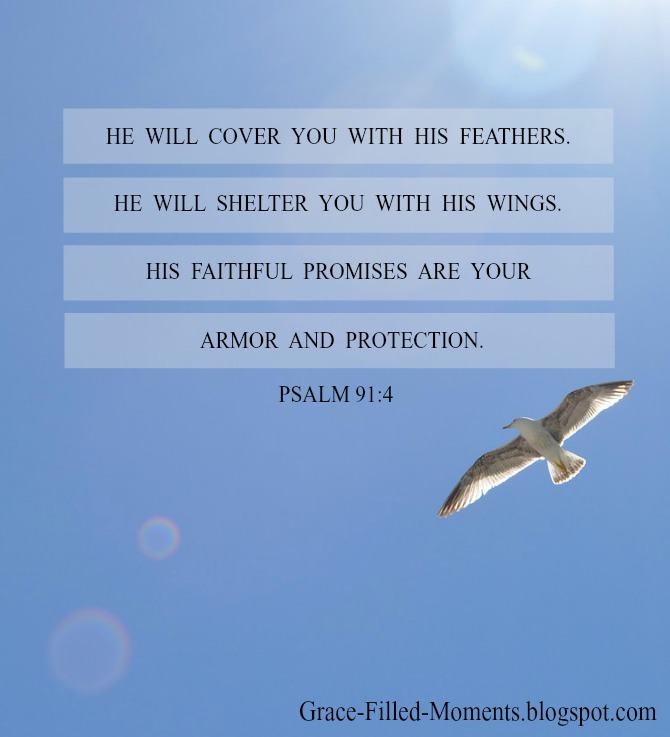 We can PUT ON (as armor and protection) God's promises! So when the enemy comes (and he will) we can stand on the promises of God and speak those promises over whatever the enemy tries to throw against us! Friends this is an exciting revelation to me!! Praise God for His promises! For this month's Marriage Prayer Calendars, I've picked Scripture verses that focus on God's promises for our husband (and for us as wives that our husband can pray over us). Let's PUT ON God's Promises for our husband! And be encouraged to know that your husband will be praying the same for YOU! Simply click on the image links below to get your March Marriage Prayer Calendar! I hope you are as excited as I am about this revelation of God's Word in Psalm 91:4 and our focus of praying God's promises over our husband and them praying the same over us! Let me know by leaving me a quick comment below! Thanks for being patient with me for these calendars! I've had a time here recently with computer issues. I had to purchase a new laptop and get everything from my old laptop transferred over to my new one. It means a lot to me that you are using these Scripture Calendars to pray for your marriages! I won't keep you longer than necessary. Here are the February calendars. God bless you all and know that I'm praying for your marriages! 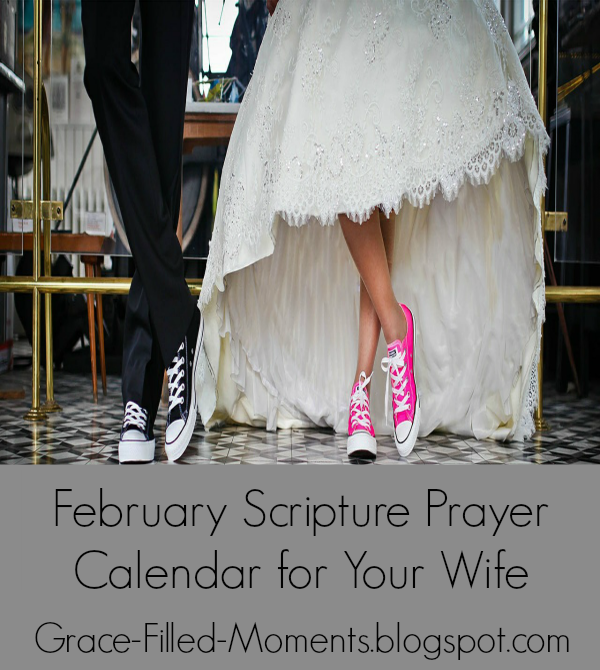 Simply click on the link below the images for your free Marriage Prayer Calendars! Happy New Year friends! Welcome to a fresh start in 2017! I want to apologize for not getting the December prayer calendars posted here on the blog. It was such a busy time and I just never got around to posting them here. I heard from a couple of you who were looking for them, so I just wanted you to know I'm sorry I let that slip. I hope you all had a Merry Christmas! We did here. Lots of fun and laughter. My daughter and son-in-love had a very exciting announcement about a week before Christmas! They are expecting their 2nd child! I cannot wait to meet our new grandbaby in July! Maybe he/she will be born on my birthday (July 3)! Do you choose a word for the New Year? I have in years past. I was considering not picking a word for this year, but today I decided I would because a word came to mind immediately as I was thinking over the events of 2016. So back to my word for 2017. I've picked "VICTORIOUS" because no matter what 2017 holds for my family, I know that we can be VICTORIOUS because the Lord goes before us. Thanks for joining me in 2017 as we pray for our marriages. God bless you all! Simply click on the images below to download your free marriage prayer calendars. October is such an exciting time in our home! My husband's birthday is October 1 and October 5 is our son's birthday. So we have been in birthday celebration mode yesterday and will be again on Wednesday. 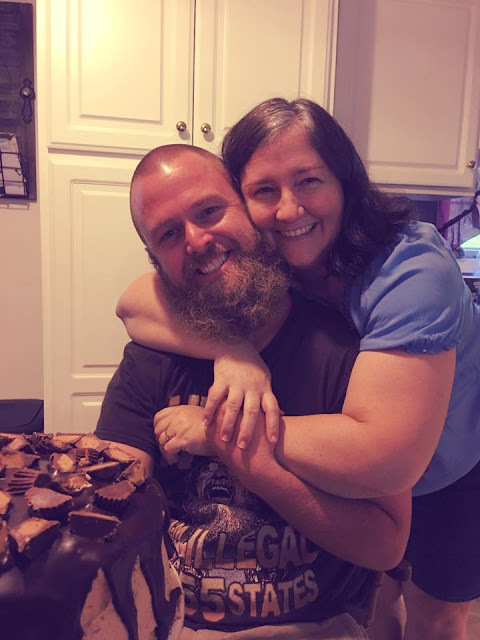 I always make homemade birthday cakes for them, and for the past 2 years Phil has asked for my Reeses Peanut Butter Cup Chocolate Cake. It is AHHMAZING!! Fall is in the air and I am loving it! I've pulled out our fall decorations and decorated around the house. From now until Christmas will be filled with so many opportunities to make wonderful, fun-filled family memories! I hope you and your family will do the same! Here are the October marriage prayer calendars for you to download for free. Happy Fall Y'all! !